For decades, Ronni’s imagination has created distinctive landscaping, exceptional hardscaping and inspirational gardens for residents of Mercer, Hunterdon and Bucks counties. Her true passion is working with Mother Nature to surround your home with beauty and balance. There is no detail too small or insignificant. Ronni and her team create hardscapes that both naturally accentuate and dramatically embellish the intrinsic features of your property. Ronni’s landscape architect and installation teams combine for over 40 years of award-winning results and customer satisfaction in New Jersey and Bucks County. They provide expert design and installation of patios, terraces, pathways, fireplaces, firepits and stone walls- featuring bluestone, fieldstone, brick or concrete pavers. Designs include a distinctive variety of pergolas, arbors, water features and landscape lighting. We are inspired by what surrounds us. Each home is a unique opportunity to draw from the canvas nature supplies . When Ronni visits your home, she’ll tour your property, listen carefully to your ideas and discuss your budget. Then, the magic begins. Ronni will be personally involved with each phase of the process - from design to installation. Ronni is a Master Gardener whose personal and professional inspiration can be traced back to the classes she took at Longwood Gardens. Ronni worked as a buyer for several of the best known landscape companies in the region as well as a prestigious firm dealing in design and installation for New Jersey estates. In 2004, she created Ronni Hock Garden & Landscape. Ronni’s designs were prominently displayed from 2006-2014 in the Junior League of Greater Princeton Showhouse & Gardens. Her work has been featured in numerous publications including Design NJ, Princeton Magazine, House & Home, PM Magazine, Town Topics and the national publication, Great Backyards. 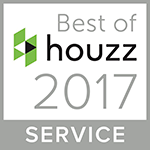 Her company was awarded “Best Of Houzz” from 2016-2019 including Best Design; “Best Of NJ House & Home” from 2015-2018. Copyright ©2017 - Ronni Hock Garden & Landscape. All Rights Reserved.